2700 Old Rosebud Road, Third Floor Conference Room for Women. The workshop is free for all therapists, law enforcement officers, firefighters, sheriffs, and EMTs. The Workshop has been approved for three hours CPE class thru the Kentucky Board of Social Work. The workshop will be offered for free for any professional who wants to attend our Divorce Workshop. $15.00 with RSVP; Cash or check at door $20. Free: Law enforcement officers, sheriffs, EMT, and firefighters. Central Kentucky Second Saturday Divorce Workshop is approved three-hour Workshop by the Kentucky Board of Social Work; to sponsor continuing education for credential holders. 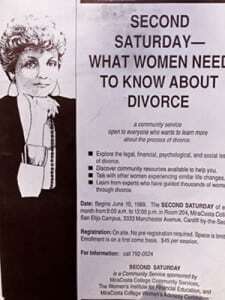 Central Kentucky Second Saturday Divorce Workshop maintains responsibility for this program and its content. The workshop will be offered for free for any professional who wants to attend our Divorce Workshop.